You see, my latest batch of kombucha made with white and green chia tea is absolutely delicious, and the Redbor kale from my CSA is so beautiful and scrumptious. It’s no wonder I had dreams of these wonderful goodies. Kombucha and kale on their own is a winning combo, but not that delicious. Enter fellow blender buddies avocado, frozen wild blueberries, coconut oil, cinnamon, and honey and you’ve got one tasty nutrient dense smoothie. With kombucha you’re getting the all important friendly flora or probiotics paramount to a healthy digestive system and overall good health. If you’re new to kombucha, check out my first smoothie featuring this fermented health elixir, Blueberry Coconut Kombucha Smoothie. One of the more nutritious greens, kale is loaded with vitamins, minerals, and antioxidants. Is there an easier way to get a nice serving of greens into your day than via smoothies? I think not. You can go a few different directions with this smoothie. If you use an avocado to thicken and blueberries as your frozen fruit you’ll definitely want to add an ample amount of sweetener. For those using more sweet fruit you won’t need much sweetener, if any. Enjoy! 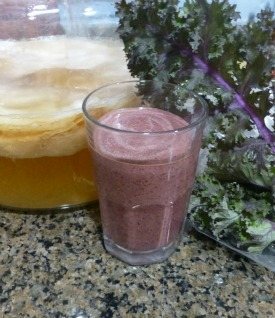 I’d love to know if you tried this kale kombucha green smoothie – please tell in the comments below. Happy Blending! I love this recipe. I make something very similar most mornings, but I wanted an alternate to milk/milk alternatives. I’m going to try the green tea tomorrow. I add Amazing Greens, ginger and chia seeds for the add ons and leave out the sweetener. Yeah, leave out the sweeteners. Instead of putting the chia seeds or flax seeds through the blender, beef up the benefits. Soak the flax seeds until they look gluey, stir in after the smoothie is blended. Some people prefer to put the flax seeds through a sieve first. Chia seeds are thought to help reduce dehydration because, when they are soaked, they carry moisture more deeply into the digestive tract. I agree with you on soaking flax and chia seeds, Jeanne, and usually include that as an option. I’ll have to amend this recipe. How do you get over the taste of maca? Makes me gag every time. I put it in capsules because even a tsp in my smoothie is gross. Maca has a nutty flavor I actually like. However, you’re not the first person who can’t stand the taste of it. If it’s that bad I would simply omit from your smoothies. There are plenty of other wonderful superfoods to substitute. I would like your ebook please! You get a copy when you sign up for my free newsletter, which I just signed you up for. Simply confirm and the e-book is yours. Awesome smoothie! Healthy & refreshing! I used GT’s Gingetade Kombucha (my fav), kale/spinach blend, avocado, pineapple, substitute coconut oil w/olive oil. Add ons-flax seed & fresh ginger & 1-cup of ice. Thanks for the great recipe, I signed up for your newsletter & look forward to trying out some more. Gingerade is one of my favs too, Kelly. I like how you modified this recipe to make it your own!